Convert your IBM Lotus Notes applications to PDF documents and HTML/JSON views that mirror the Notes views (hosted locally or on a web server!). Save documents from any Lotus Notes database as custom-named PDFs in a folder structure, with sidecar XML files to store your metadata. Upload exported documents and metadata into your Microsoft SharePoint / Office 365 library in just a few easy steps. After your data has been extracted from Lotus Notes databases, you will no longer need IBM Notes and Domino to access historical records. Seascape for Notes preserves rich content, document hierarchies, categories, views, links, and metadata. A built-in PDF conversion engine, trusted by over 1,000 organizations, will ensure that your existing Notes content is converted to PDF (or PDF/A) with high fidelity. Full database export: Hierarchical views with documents, links and metadata. Export data from Lotus Notes: Choose between three archiving options. IBM Notes Database Catalog: Navigate through the Seascape archives with ease. Plain database export: Notes documents to portable PDF + XML files. SharePoint: Upload exported Notes documents to SharePoint, now or later on. Application data export: From IBM Notes to vendor-neutral repository in 3 steps. "Seascape for Notes was the best solution for my Lotus Notes archive project. My users like to use the new document navigator tool. I'm very satisfied with this product." "The simplicity of installing Seascape and converting databases was very intuitive. We also were impressed with the aesthetically pleasing layout and the conversion speed." "SWING Software was great to work with and it only took a few weeks from to start to finish. We highly recommend SWING Software for anything IBM Notes and Domino related!" Real independence: You only need a web browser or a PDF viewer to access your extracted Notes data—nothing else! High-fidelity conversion: A powerful PDF creation engine used by thousands of Notes professionals guarantees a high-fidelity representation of your Notes content. Complete archiving: Save your views, documents, doclinks, file attachments, and metadata, and enable your users to access the data in almost the same way as they did in Notes. Convenience: Make use of numerous advanced features, such as batch archiving, custom naming rules and folder structures, database catalog, export privileges, and more. Extracting inactive (static) data: Get ready for records requests. Extract read-only data from Lotus Notes databases, for regulatory, legal, or business reasons. Application retirement and archiving: For long-term archiving, data should be detached from the original application and saved to an open-standard repository. Application modernization: Preserve all historical records and migrate only the active data. 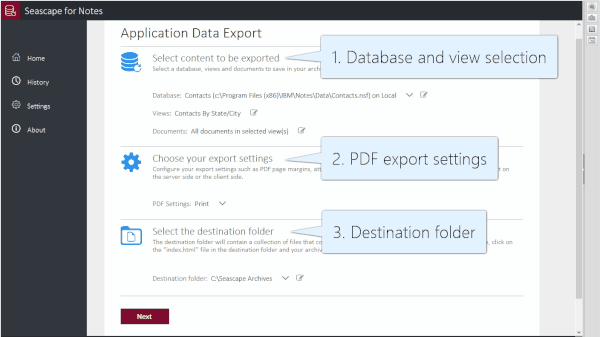 Do you need a one-off export from Lotus Notes databases? Don’t want to purchase a software license? If so, learn more about our Premium Export Services. What is a Lotus Notes database? This question might seem redundant at this point, but what if you have inherited some databases that you don’t know much about? Thus, let us briefly describe what a Notes database is. IBM Notes/Domino databases are NoSQL, document-based databases. One specific type is a mail database, which contains emails. A single database file (NSF) typically contains multiple documents with rich content (emails are also documents), views, and application logic. Because of this compound nature of the NSF file, where code and data are packaged together, it is an application file as well. These applications run on Domino servers and Notes clients. It is not necessary to be an IBM Notes/Domino specialist to extract content from Notes databases. Simply, fire up the Notes client (if you need our assistance, just drop us a line) and run Seascape for Notes. You can export databases stored either locally, or from any accessible Domino server. According to our survey, 93% of organizations have an action plan for Lotus Notes applications and data. You can start now by downloading Seascape for Notes. Or let us run the export for you.